Locking up men who beat their partners sounds like a tremendous improvement over the days when men could hit women with impunity and women fearing for their lives could expect no help from authorities. But does our system of requiring the arrest, prosecution, and incarceration of abusers lessen domestic violence or help battered women? In this already controversial but vitally important book, we learn that the criminal justice system may actually be making the problem of domestic violence worse. Looking honestly at uncomfortable facts, Linda Mills makes the case for a complete overhaul and presents a promising alternative. The evidence turns up some surprising facts about the complexities of intimate abuse, facts that run against mainstream assumptions: The current system robs battered women of what power they do hold. Perhaps as many as half of women in abusive relationships stay in them for strong cultural, economic, religious, or emotional reasons. Jailing their partners often makes their situations worse. Women are at least as physically violent and emotionally aggressive as are men toward women, and womens aggression is often central to the dynamic of intimate abuse. Informed by compelling evidence, personal experience, and what abused women themselves say about their needs, Mills proposes no less than a fundamentally new system. Addressing the real dynamics of intimate abuse and incorporating proven methods of restorative justice, Millss approach focuses on healing and transformation rather than shame or punishment. 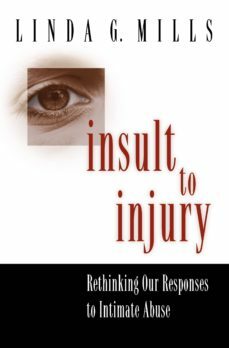 Already the subject of heated controversy, Insult to Injury offers a desperately needed and powerful means for using what we know to reduce violence in our homes.